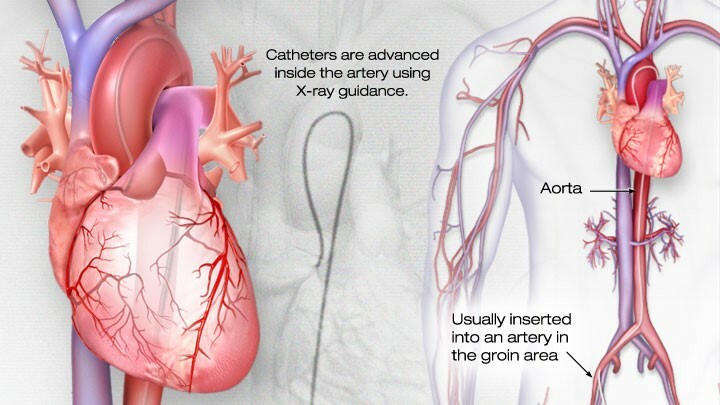 Cardiac catheterization is a procedure used to insert the dye into the coronary arteries during coronary angiography. Please arrive at the hospital’s outpatient entrance to register, making sure you bring your insurance cards and picture identification with you. 1. DO NOT eat or drink anything after midnight the night before your procedure. Diabetic medications, including Glucophage. Stop taking the night before the procedure. Diuretic medications/“Water pill” such as Lasix or Hydrochorothiazide. Do not take the morning of procedure; you may resume the evening after your procedure. Bring a list of ALL medications, including over the counter medications. Include dosage and times you take them. 3. Take a shower the night before or the morning of your procedure. 4. Please leave ALL valuables at home. 5. If you become sick with any virus, sore throat, temperature/fever, or cough, notify your cardiologist prior to coming to the hospital. 6. Make sure you have an emergency contact with their phone number. 7. You will NOT be able to drive yourself home, so make sure you have a responsible person to drive you home. 8. Make sure to have your lab work drawn 2-3 days prior to the cardiac catheterization. These can be drawn at the lab or hospital of your choice. A prescription for the lab will be provided to you. (561) 514-6618 or contact the Cardiac Institute of the Palm Beaches at (561) 296-5225. You will be able to eat and drink shortly after reaching the recovery room. You will be given I.V. fluids or asked to drink plenty of liquids in order to flush the dye from your body. Dr. Fenster will be able to discuss some of the results with you soon after the test. A more complete and detailed analysis of all the findings will take more time.